Essraa Nawar is the Development Coordinator at the Leatherby Libraries at Chapman University and the Chair of the Arts, Exhibits and Events Committee at the library. Essraa joined the Leatherby Libraries at Chapman University in June 2011. Essraa received her bachelor’s degree in commerce with an emphasis in accounting from Alexandria University, Egypt. She also holds a Master of Business Administration (MBA) from the American Management & Business Administration Institute, Cambridge, MA and a Master of Arts in Organizational Leadership (MAOL) at Brandman University. She is currently pursuing a Master of Library and Information Science (MLIS) at San Jose State University. Essraa is originally from Egypt and prior to moving to California, she served in the new library of Alexandria (Bibliotheca Alexandrina) for four years. She was involved in the acquisition of library materials through both purchasing and donations. She was actively involved in the solicitation of rare and unique gifts, and has also helped create the library’s Duplicate Materials Exchange Program. Over the years, Essraa has studied, lived, and worked in many places, including the Gulf area (Qatar) where she spent most her elementary and middle school years; Washington D.C, where she worked for The Royal Embassy of Saudi Arabia, and most recently moving with her husband and family to Orange County, California in 2009. 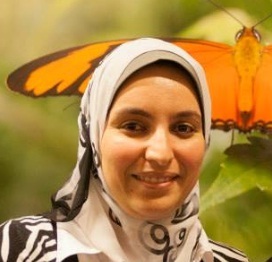 Essraa served as the President of the Parent Teacher Organization for the Orange Crescent Islamic School in Garden Grove for the academic Year 2010-2011. Her professional interests include developing and implementing marketing, branding and communications practices to support the Leatherby Libraries strategic plan in attracting faculty, staff, students and other entities on and off campus, as well as maintaining an integrated external relations model targeting prospective donors, current donors, board members and external partners. She is also very interested and active in the topics of interfaith dialogue, empowering Muslim Women and embracing diversity. In her free time, Essraa enjoys watching her boys do gymnastics and diving, in which they excel and are both part of the USA National team as well as spending time with her little baby girl. Why are people like yourself not condemning the brutality that extremists are doing in the Middle East? Please comment on the following statement. How can a Westerner believe that Islam has any association with peace and moderation one many of us believe there is NO tolerance in the Muslim religion. Hello Elliot and thank you so much for your comment and question. Let me know what you think as we are trying our best. Thank you Essraa for being an ambassador of Islam. I don’t know, but I have the feeling that these people (Islam haters) will NEVER get it, no matter what you do or say. Unfortunately, the “anti-Islam” brainwashing they got appears to be permanent. One more time without auto-correct on! I spent about 20 minutes trying to figure out how to compliment you on your article What I Learned When I Moved to America… I NEVER comment but felt compelled to thank you. I am a 40 year old white male socially liberal republican. I of course rarely read the Huffington Post website but I got lucky today. Good luck and just like “don’t believe media stereotypes bout Muslims” the same could be said for the even more media demonized group “White republican males” sometimes we get bad raps also. Thanks again for the article. It “felt” good to read it. Thanks so much Jake for your comment on my blog. I am glad that I am making a difference and I have to tell you although I am a Muslim Women one of my best friends is a 50 years old White Catholic Man.